You've heard the same things I have: "You can't control mobile device proliferation." "Most large organizations are being forced to create BYOD programs." "You need to let new employees work with their own devices and use social networking sites if you want to recruit them." I went to an HP Cloud analyst type event yesterday, under NDA of course, so let me tell you some stuff! The more I examine the Social Enterprise, especially socially enabled enterprise applications, the more I feel the pain of the average user. Using socially enabled applications is a bit like walking through what you think is a sprinkler and suddenly realizing it's a fire hose. Many enterprise social solutions are so jam packed with every imaginable social communication and collaboration tool, which are attached to all the entities in a system, that it is easy to become overwhelmed. Users are asking themselves "Which feature should I use?" and "Where does it make sense to use it?" There are pockets of users that are trying out everything but there are more people that are disregarding social tools altogether. It's too much of a good thing. This week, the Wall Street Journal published an article entitled 'Drowning in Email, Photos, Files? Hoarding Goes Digital'. How could I not be intrigued by the fact that this particular article wasn't in the business or technology section, but rather the personal journal section under 'Health & Wellness' right below an article on how horrible a tick season we will be facing! Who do you love? Nasuni. Time for some success stories. This latest ESG Lab report documents how NexGen Storage combines the performance advantages of low-latency RAM and PCIe SSD with cost-effective high-capacity disk drives to create a storage solution that's ideally suited for mixed workloads and consolidated virtual server environments. Multi-phase data reduction and storage performance QoS (Cruise Control for Storage) delivers the performance that's needed, when and where it's needed, at a cost that's comparable with a traditional disk array. While OpenFlow and Software Defined Networking (SDN) are gaining traction in large telco and cloud service providers, many networking teams are still unsure of these technologies and how they will impact their environment. This is supported by recent ESG research that indicated a low familiarity with Open Flow technology-less than 1/3rd of respondents were familiar with it. Given its relatively short time in the market, that probably is not a surprise to many of you. Have you been following the Da Silva proceedings? It's turning into a real soap opera. Allegations of back-scratching all the way to the top, forced hands, the e-discovery digerati colluding to pervert justice. Juicy stuff. 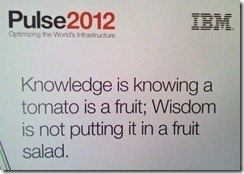 Whether you are a buyer of IT stuff or a vendor trying to build and sell IT stuff, you should pay attention to this lesson. Understanding "market" state and function will help you better understand what you can expect to deal with in your quest - regardless of what that quest is. Between EMC's announcement of the Pivotal Labs acquisition and the incredible presentations so far at GigaOm's Structure Big Data conference in NYC, there is a strong continuing theme with Big Data this week (one that I am a strong advocate of): it is all about the apps and the people who use them. We are a few weeks away from the Open Networking Summit (www.opennetsummit.org) which will be held in Santa Clara April 16 through 18. Mercury is in Retrograde, Are You Prepared? It's been about a month since I last blogged about cybersecurity legislation, so here's a brief review of where we stand. A few years ago, I began writing and talking about data encryption management problems on the horizon. I was right about the issues, but a bit aggressive on the timing. Based on what I'm seeing lately, however, the encryption management sky may finally be falling (or at least starting to fall). Special thanks to Terri McClure for coming up with this one. In short, the key takeaway here is not simply that Judge Peck approved the use of technology assisted review. While a precedent has now been set for the use of computer assisted review technology, the Opinion itself actually spends very little time discussing the specific technology selected by the parties. Judge Peck does, however, spend more than 25 pages discussing the process that the parties' attorneys applied to the use of the technology in this matter, going so far as to attach another 25 pages worth of protocol agreed to by the parties for the technology's use in this case. It appears that to this court, it is the process that is key, not the particular technology standing alone. Without a defensible, supportable, and explainable process, technology assisted review is no better and probably less defensible than other review approaches. As Judge Peck concludes: "As with keywords or any other technological solution to ediscovery, counsel must design an appropriate process, including use of available technology, with appropriate quality control testing, to review and produce relevant ESI while adhering to Rule 1 and Rule 26(b )(2)(C) proportionality." Opinion at 25-26. I've bolded the "pull quote" for me. Remember that the initial approach on this case suggested by one of the parties was thrown out by Judge Peck as indefensible (judicial-coup-for-computer-assisted-review/index.html">as I discussed in my last post), since it would have missed too many potentially responsive items by only including the first 40,000. Judge Peck's opinion is being heralded as a "game-changer"--will the next inevitable step toward acceptance be adversaries' attempts at "gaming" discovery with their predictive coding process? Which brings me to the importance of sampling. It's interesting: one predictive coding power-user I spoke to recently said he actually thought the random statistical sampling technology being built into many review tools was more significant and useful in his review projects than the predictive coding capabilities themselves. Another agreed that sampling was critical, but criticized the methods used by his particular tool, saying his quants had calculated mathematically that it required an overly broad sample. I've heard yet another argument that statistical sampling is insufficient--that samples should be weighted and constructed as "representative" of the rest of the document corpus, depending on the data contents. I suspect these debates are just gearing up. It's not a matter of whether predictive coding is theoretically defensible anymore, but how you're using it and how effective and defensible it will be. Will predictive coding now go from the boogeyman of "automating attorneys" to becoming just a more quantitative stick to beat litigants over the head with? Maybe so--if they don't understand the tools and process involved. Yes, I know that in certain circles I'll get some ribbing for devoting blog-column-inches to tape storage. But last week I spent a day and a half at the "Tape Summit," and I have to report that the Kool-Aid was actually rather good. By the way, I also know that many of you reading this probably have tape and so I'm here to tell you that you need not worry....you're not alone! Vinny and I recently tested an IT storage solution at Nasuni, a high tech startup near Boston where you'll often hear the locals describing stuff as "wicked good" or "wicked cool." After a couple days of ESG Lab hands-on testing (and some great sushi), we're pleased to report that the "wicked smaht" team at Nasuni is delivering wicked good storage services. The market for online file storage and collaboration solutions continues to heat up. When Kristine Kao and I published our market landscape report in December, we narrowed the field of players down to eight vendors - certainly there were a lot in the mix, but when we put the "business use" and "collaboration" filters on the project, we ultimately had to exclude those that focused primarily on backup and archive or lacked any business licensing models. You have to give Dell a lot of credit. As the company recognized changes in the industry, it was willing to move beyond efficient PC/server manufacturing and distribution into new technologies and labor-intensive services. In my domain, this led to the acquisition of SecureWorks and Force10. Today, Dell took another step into end-to-end solutions by grabbing security veteran SonicWall. I spent last week in rainy and chilly San Francisco. That must only mean one thing; it's RSA time again. I've been to quite a few RSA conferences over the years, too many to count, it seems. The early years were truly serious security events with a no-nonsense vibe. Not that security is still not serious, but the last few years seemed like the hype was starting to overtake some important security developments. As I attended the first day of this year's RSA, I was bracing myself for another "Cloud" marketing onslaught, or possibly a "Big Data" blitz. I was pleasantly surprised. The message was more muted this year with an emphasis on getting back to the business of comprehensive security solutions. It's always refreshing to have something a little different to write about-earlier this week Nexsan furnished me with an opportunity to do so by launching its latest line of unified storage - the NST5000. While Nexsan has always impressed with its functional breadth and pleasantly-surprising bang for the buck, it's the noticeable and thoughtful 'nudging of the envelope' that sets it apart. As ever the company's latest product has an almost embarrassingly long list of goodness: truly impressive density, ease of use, up to a PB of capacity (my, how the definition of mid-range has moved eh!?) and masses of Xeon cores to power it. So far, so good. It's almost de rigueur these days of course to offer tiering and caching, and Nexsan does that too. And, while one can have some excellent philosophical and technical debates about the extent of unified storage that various other vendors really deliver behind their claims, Nexsan can support genuine simultaneous NAS and iSCSI behind its single management system. Check. Is Your Network Ready For Romley? The much anticipated Intel Romley launch occurred this week and major server vendors like Dell, HP, and IBM announced their next generation systems to take advantage of the increased horsepower and reduced power consumption delivered by the two socket Sandy Bridge-EP based product line. By all accounts this is an impressive platform, with up to 16 cores and 32 threads, that should trigger a server refresh cycle in the data center. Lessons from CITE: Empower the Consumerized Workforce Before it Empowers Itself! How many mobile devices do you have that you are using for business? Most of the audience had at least 4 (only two were with me at 6 or more...we are forming a support group). How many of you are using solutions like Dropbox, Box, Egnyte or Sugarsync? Pretty much everyone. How many of you are using these without them being IT sanctioned? More than half the audience, and these are IT folks! That's the thing. Mobile device users are empowering themselves with solutions that allow them to access their one copy of data from any endpoint device and anywhere - they are not waiting for IT to solve the multiple device data access issue. These solutions are already in the enterprise. But the big challenge there, the big danger there, is that when users sign up for these accounts, any data that they store in Box, YouSendIt, or whatever solution they pick goes with them when they leave. Data stays with the account owner, and in a BYOD environment you can't do anything about it! One user I spoke to this week made the point that they wipe everything off of every device when a user leaves, it is part of the contract, but really, how many companies have that type of policy in place? How much will employees stand for it when they use the device for both personal and business use? If a company sanctions and deploys an online file sharing solution for its employees, the tables are turned, they are in control. If they use something like Syncplicity, YouSendIt, TeamDrive, or many of the other 20 or so vendors now in this space, when someone leaves, they can just wipe the folders. In some solutions they can fully track data flows into and out of the folders (very big brotherish - but there are a variety of solutions on the market to meet the variety of corporate requirements). It is not perfect and there will likely still be security holes, just like there are today. But the thing is, if the company deploys the solution, the data stays with the company. This is really why IT needs to get in front of this issue - if the data stays with the owner of the account, the owner of the account needs to be the business! You can read Terri's other blog entries at IT Depends. Yesterday, Amazon announced some big price cuts for its AWS and EC2 services, amongst others. I love when IT vendors poo poo anything Amazon does, but man are they wrong. It is truly amazing how quickly the online file sharing and collaboration market has been inundated with vendors either expanding into the space or new start-ups cropping up with new offerings. It's a really hot market right now, because it is a really big problem for enterprise IT. Data growth is what destroys everything in IT operationally. If data stopped growing, you could actually fix all of your issues once and for all. You would be stable. What a concept! This morning's keynote at IBM Pulse was a refreshing resetting of my perspectives on a few fronts. I've been to about a dozen RSA Conferences in my career. Some were really geeky, some were nothing but hype, but last week's event stood out as truly valuable. Yes, marketing rhetoric was in the air as always but under the spin was some truly good dialogue. Magistrate Judge Andrew Peck, of the U.S. District Court for the Southern District of New York made e-discovery headlines late February with the first judicial endorsement of predictive coding. I'll leave it to the legal eagles to debate the courtroom implications, but it's a significant stamp of approval from the bench.You can read more from LTN, Forbes, Chris Dale, and Recommind, whose Axcelerate software is involved in the case. The more I speak to software vendors, IT, and end-users about socially enabled applications, the more apparent the absence of some ISVs from the social conversation has become. It's not just that some companies don't have social applications as of yet. Many show no signs, make no announcements, or give no inkling of social features in their products.